Ready for some more Brown-Forman? Yeah, I know. I feel the same way. But if all we drank was the Buffalo Trace Antique Collection then, well, then we'd......that's a bad example. Just because we may have had a bad experience with all of a certain company's brands it doesn't mean we should write them off entirely. Or at least give them their proper due in a report if they do stink. So, ready for some more Brown-Forman? 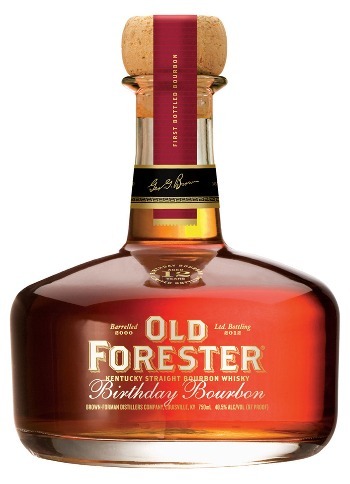 The corner liquor store near my last job had a slew of these (above) 200mL Old Forester glass bottles from the 1990s. (The front label from the '80s was similar, but had a blue proof stamp in the center of it.) The store also had some older bottles of Dewars White Label, but no thanks. This OldF was only $4.99, so what the heck. Nose - Straight out of the bottle: Caramel, orange peel, turpentine, rotting apples, corn syrup, and burnt paper. After 20 minutes: maple syrup and talcum powder. Palate - Approachable. Short alcohol prickle, lots of vanilla, taffy, and lightly nutty like biscotti. It's sweet at first then dries out a little and has a non-distinct fruitiness. Finish - Weird and off-putting after the decent palate. Bitter, sugary cheese. Per my notes, it looks like this older version is subtler than the current one. What they have in common is an odd finish. Everything is decent until the finale, which is the wrong place to go awry, as that's the last thing the customer/audience/drinker remembers. This 1990s version is not half bad on the rocks, where the ending is silenced. It also makes a respectable Old-Fashioned, of which I am sipping in between paragraphs of this post's rough draft right now. Thank you to JLR for the sample! This annual release with its cool decanter marks the September 2nd birthday of company founder George Garvin Brown. The whiskey was distilled all on the day same day, at least 12 years before bottling. According to the marketing materials I've seen online for the 2012 edition, Master Distiller Chris Morris had plopped an extra 2% of malt into the fermentor which influenced the final palate. Nose - Big caramel candies swimming in vanilla simple syrup. Honey, toasted whole wheat bread, a pinch of rye spices, maybe a hint of peanuts? Palate - Dried leaves, apricot jam, orange marmalade. Barrel char, a moment of chlorine, a little barley cereal. It's rich and bold, I'm glad it wasn't reduced! Finish - Lotsa oak here. Goes sweet to dry. Extensive and sticky. Citrus, caramel, and ripe stone fruits. Yum. The finish is the weak point again, but the nose and palate are very solid. No ice or water on this one, please! The 2013 edition should be hitting the stores any day now and will have the same 48.5% ABV as its predecessors. The Birthday Bourbon sells out pretty quickly each year, at least around the LA area. It's a tasty one, but it'll also cost you up to $55 (per its MSRP). Is it worth $55? I don't know, though that does seem to be the going rate for Single Barrel or Special Editions from non-BT/non-Roses companies. What I can tell you is the Birthday Bourbon is in a completely different league than its OldF brothers. Availability - The current version is carried by most bourbon retailers. Thanks Whisky Bro! Though this decanter would take up almost two bottles' worth of space in a whisky closet. I'll keep my eyes out for it. The 2010 edition was awesome! You know what's ridiculous? I picked up that bottle of 2012 OFBB for $30. One year later, it's almost double the price. This whisk(e)y craze is completely out of hand. I'm curious to see what the price will be on it at our usual haunts. If it's at $40, that would be very tempting.